have your drinks without a plastic straw - ask for ice and no straw! 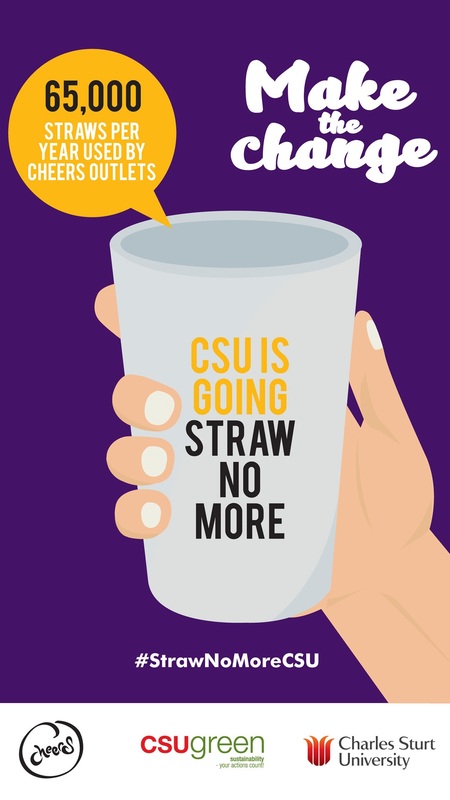 CSU is now single use plastic straw free! 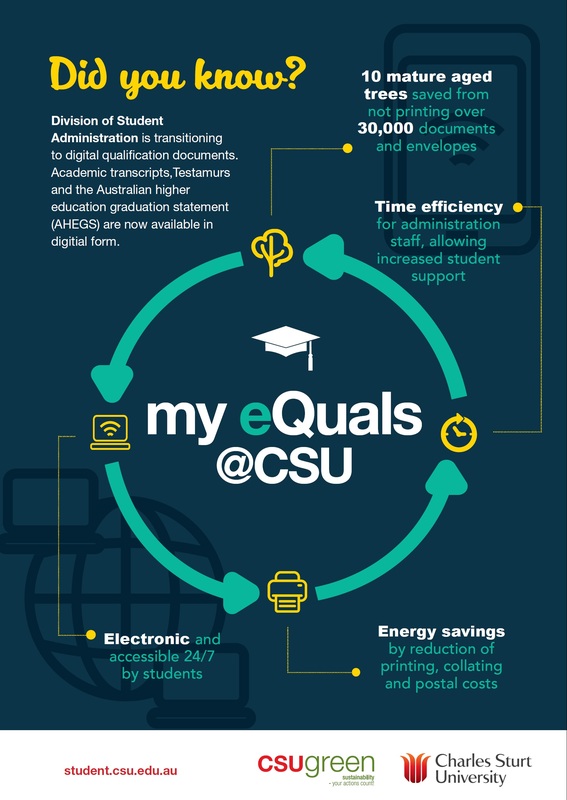 Register with My eQuals to receive your university transcripts electronically and save paper! You can reduce waste on campus and in your office through CSU Green’s great recycling initiatives. If you require a new or replacement bin, please contact your office administrator or raise a BEIMS request. Five sites across Wagga campus now have installed 'worm hotels' to take organics from offices and residential buildings. This project was funded through a CSU Green project grant in 2017. 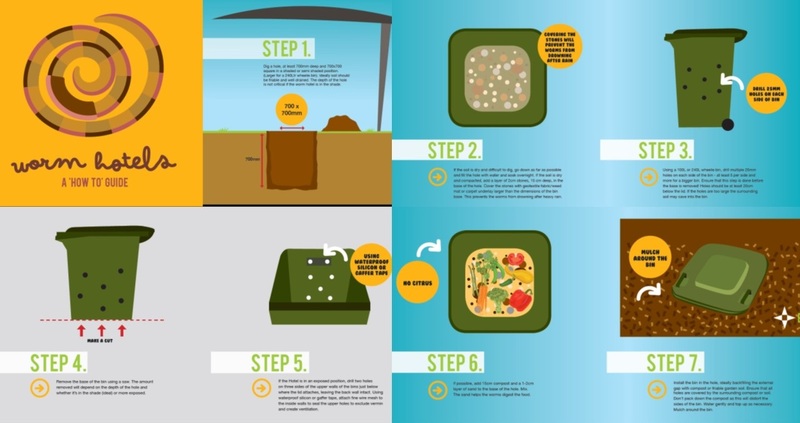 Download instructions from the project team on how to install worm hotels on your campus or at home. Please note if you are thinking about installing worm hotels across CSU campuses you must discuss this with facilites management and CSU Green to ensure the system can be installed and maintained correctly. “Possum boxes, security light inspections and the green waste organics program are some of the changes that have occurred at CSU Orange around sustainability. However, the most significant change has been the replacement of the electric hot water systems in residence 1050-1054 and 1060-1063 to solar hot water with increased storage capacity. CSU Green developed the tender documents for the installation of a solar hot water system to replace the existing electric hot water systems. A contractor was engaged and the new system was installed in 2013/14. A total of 22 solar tanks were installed using the evacuated tube system on the resident’s rooves. We faced some challenges with the installation of the solar system, tanks were leaking with controllers and pumps failing with the first 12 months. CSU Green engaged a consultant and rectification works were arranged. Further failures in 2015/16 led to the replacement of all remaining hot water tanks, controllers and pumps with headers installed where dual tank were in place. In 2016 the new installation of approved Apricus solar tanks was completed and new roof header units were installed with the replacement of approximately 100 evacuated tubes. The system is now working 100 percent with decreased requirement for the electric backup. CSU Green undertake energy reporting and we anticipate a significant reduction in power usage in the residence buildings. We are now confident that the capacity of the solar system storage will meet the demands for hot water by the residents in these buildings. By Therese King, DFM Orange in November 2016. “Some of the sustainability changes that have occurred on at CSU Dubbo include the installation of smart metres measuring power consumption. This provides a weekly snapshot of consumptions. Additionally a recent change has been the establishment of the multi-cultural reconciliation garden. However, the most significant change has been the waste recycling initiative. This is the most significant because previously most of our waste was going into landfill which is not really acceptable for a professional organisation now. Before, nearly all our general waste went to landfill including rubbish from the cafeteria, empty plastic bottles, paper wrapping, office waste and so on. CSU Green rolled out a recycling initiative across all campuses and now we sort our waste and co-mingle recycling of our paper and cardboard. At the start CSU Green removed office waste paper baskets and replaced them with small red desk bins for all staff. People were educated and there was a bit of push back initially, but eventually everyone accepted the idea. By Ben Moore, DFM Dubbo in November, 2016.